I’m searching the country looking for sausage perfection. I’ve tried some great recipes as I seek out traditional sausage making techniques and quality local ingredients. My adventures looking for the best creations have taken me far and wide but once you have the perfect sausage what is the perfect wine to drink with it? I recently got together with Johnny from Vanvino to get some expert help on what to look for in the perfect wine to go with the greatest sausages. I got some really good advice from Johnny and, just when I thought I might catch him out with a curved ball, some spicy lamb merguez based on a North African recipe, he had the perfect wine to go with it! 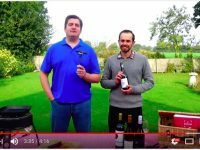 In this video we pair some cracking sausages from Norfolk based Fruit Pig Company with some awesome wines which Johnny selected at his local high street wine merchant, Reno wines in Wymondham. I would love to hear about your favourite wine to drink with sausages. Leave a comment below! A sparkling brown pale (wine) beer is excellent with a chorizo. i would recommend Hapi Daze by Garage Project.